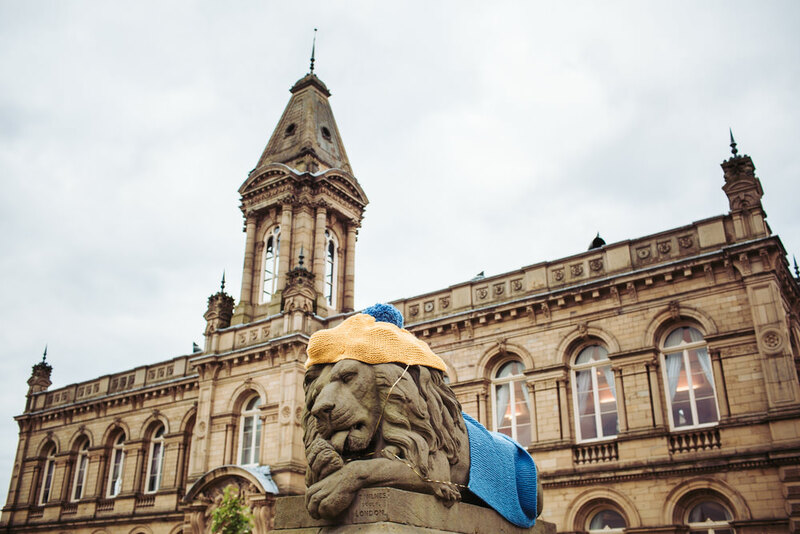 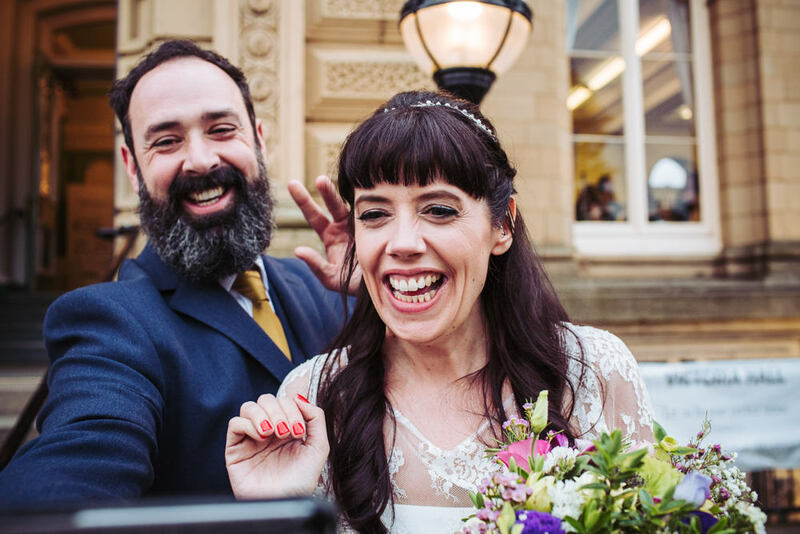 It was great to be Beth and Jon’s (aka Biff & Jiff) Shipley (in West Yorkshire) and Victoria Hall wedding photographer and was nothing short of a wonderful day! 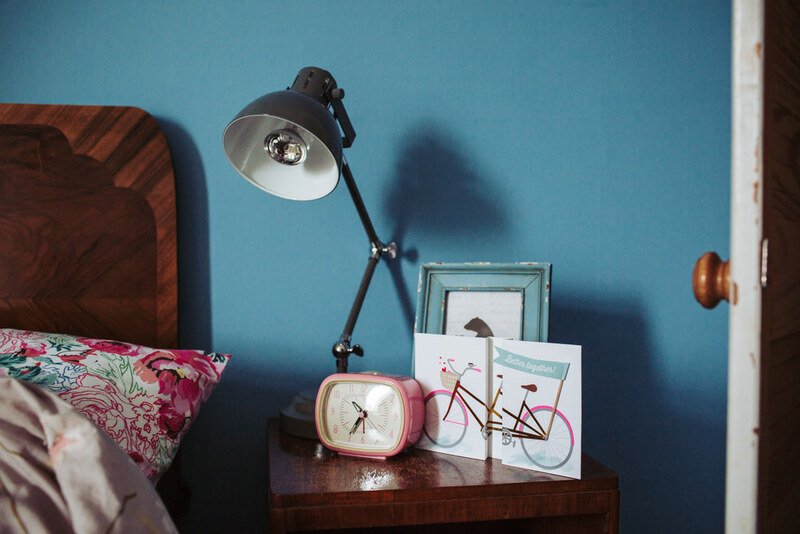 Beth prepared for the day ahead at home with her family and scaredy cat, Dot, who mostly hid under the bed. 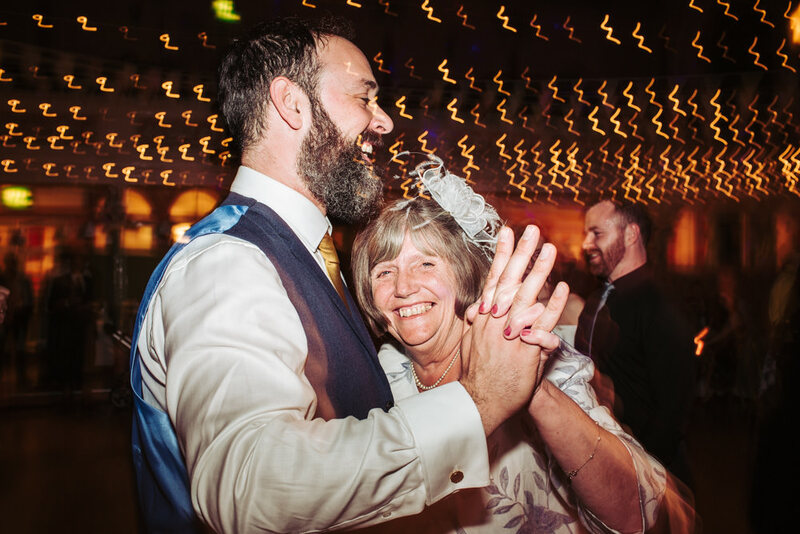 Meanwhile Jon calmed his nerves by nursing a pint or two at Fanny’s Ale House (a drinking establishment I have a soft spot for myself as I first met my husband here) with his family and guests. 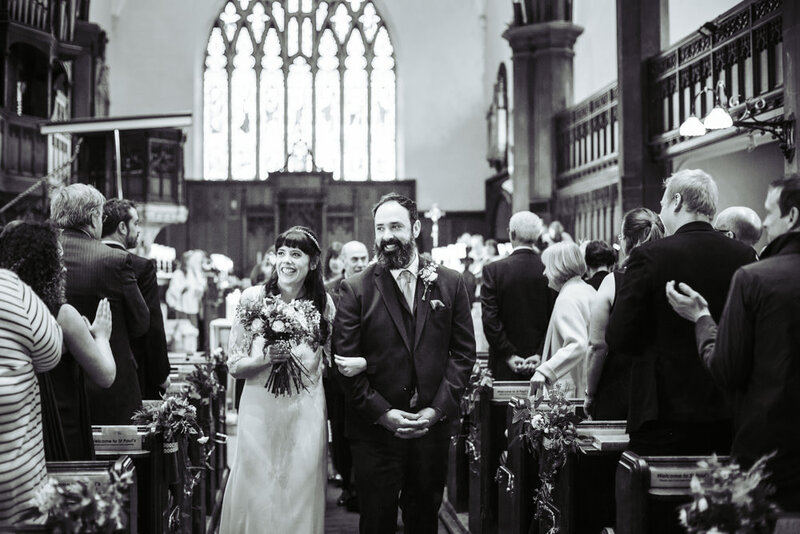 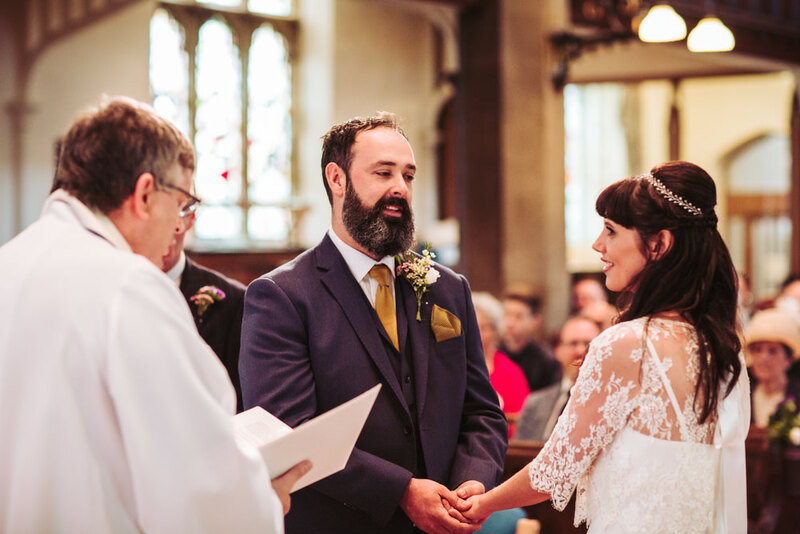 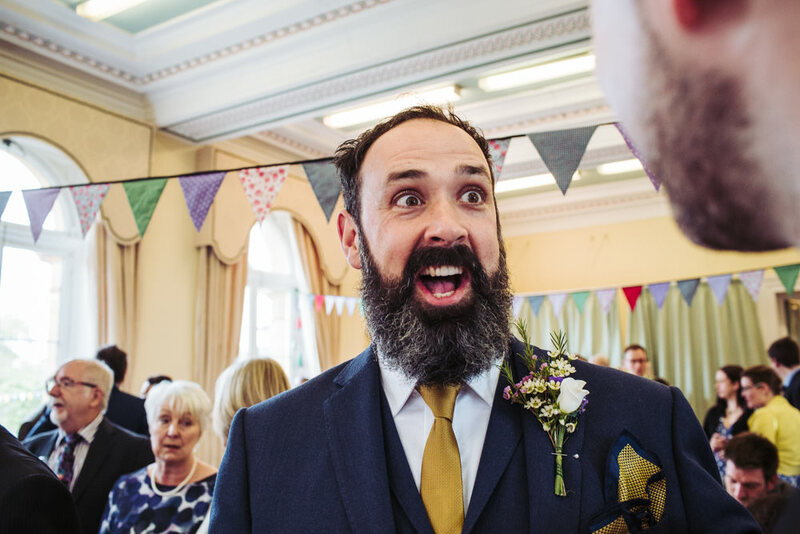 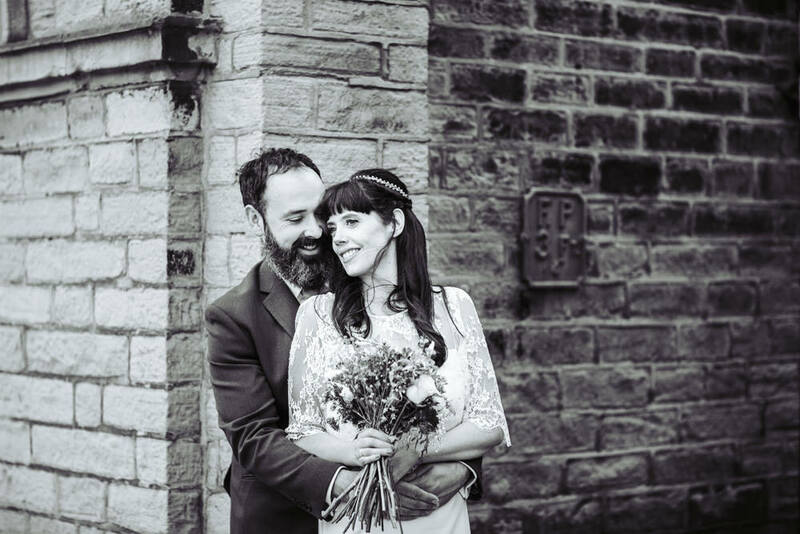 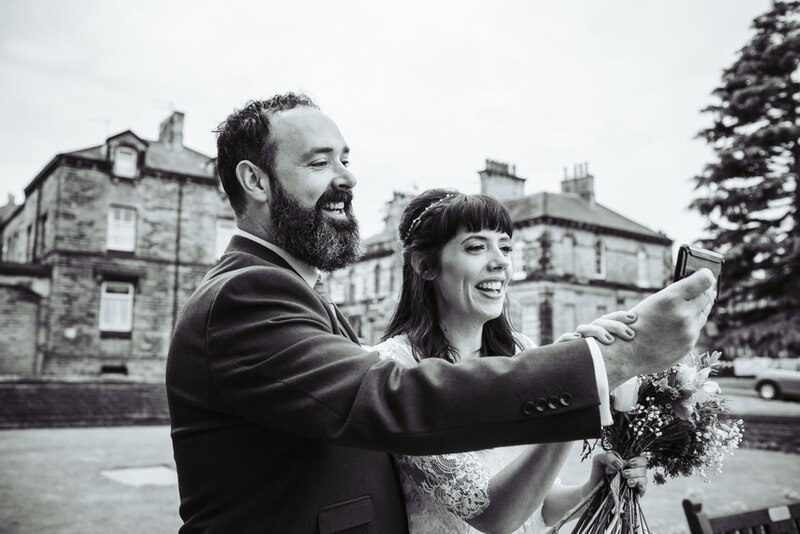 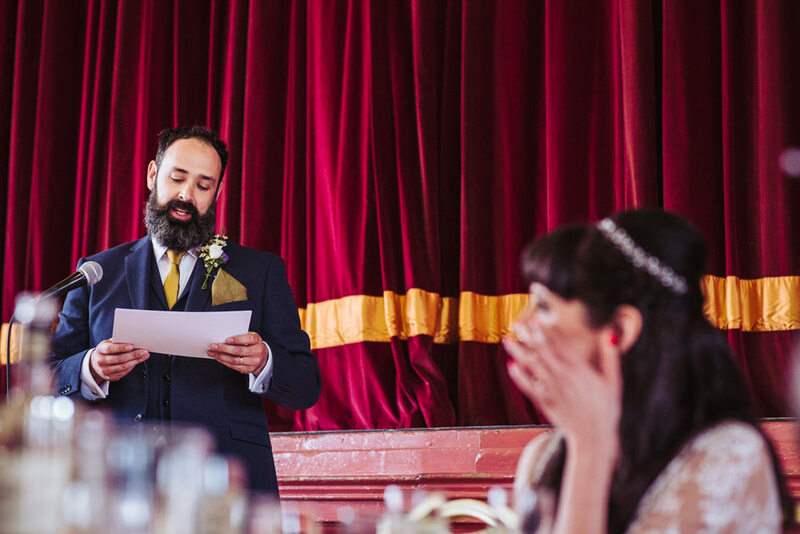 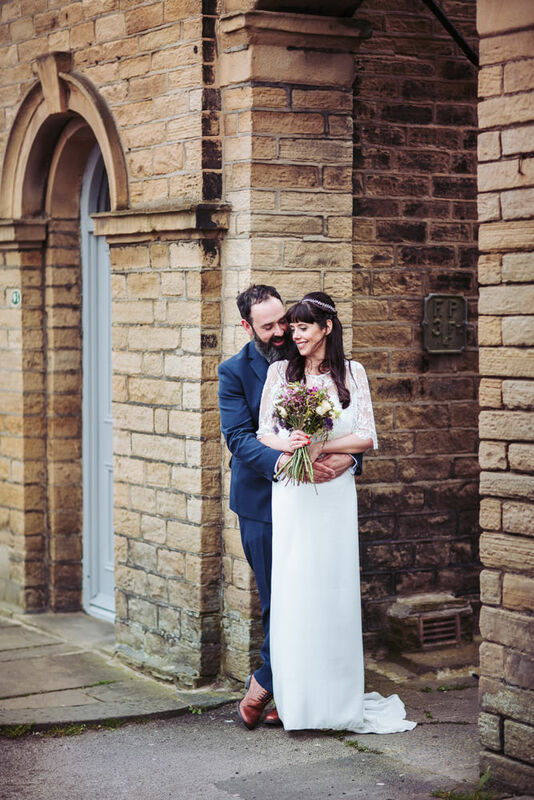 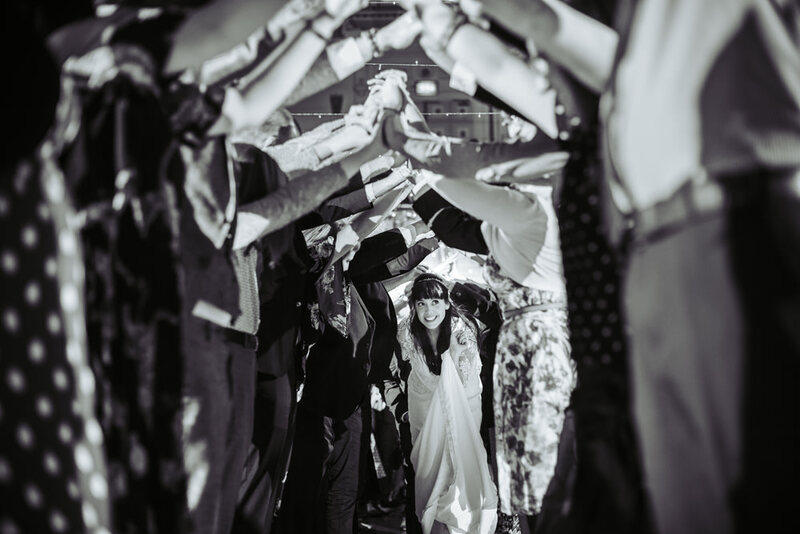 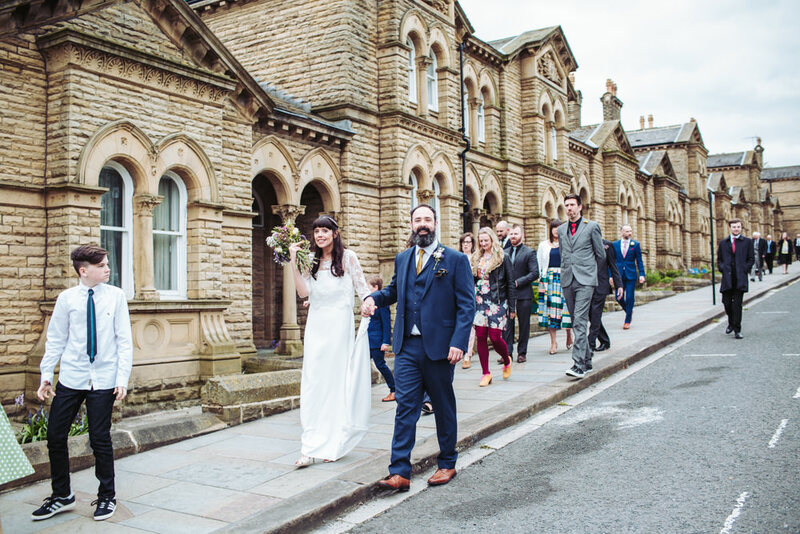 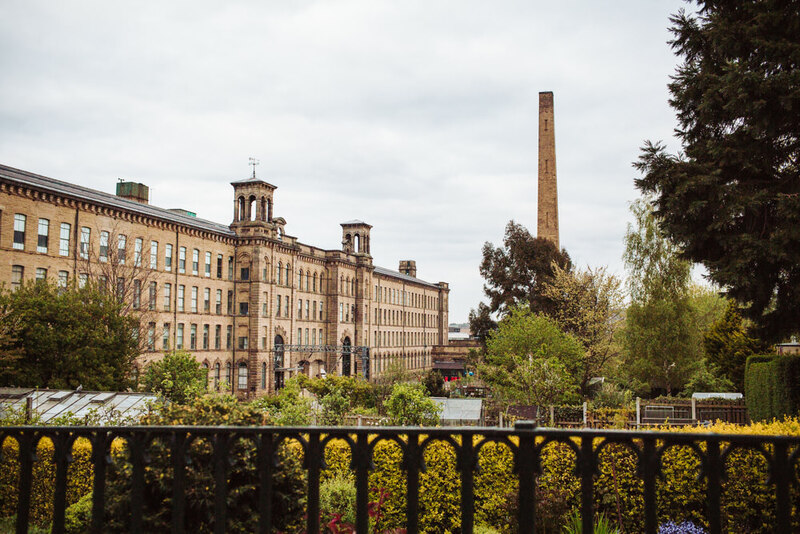 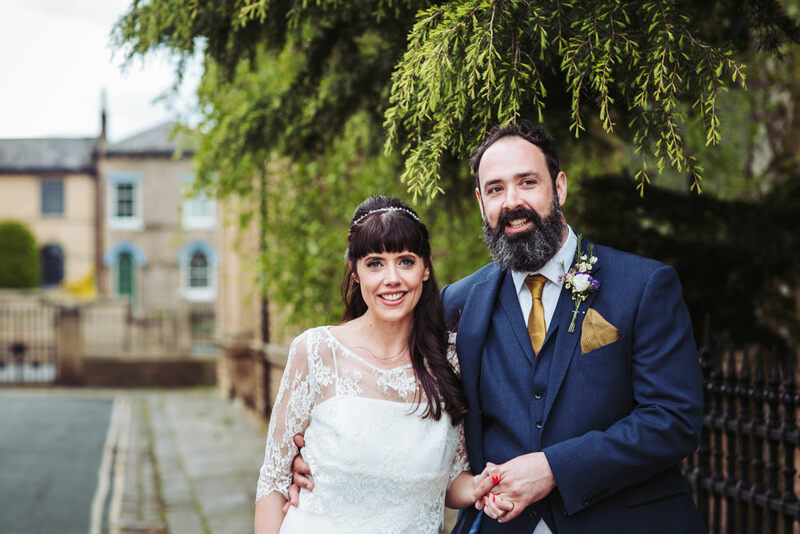 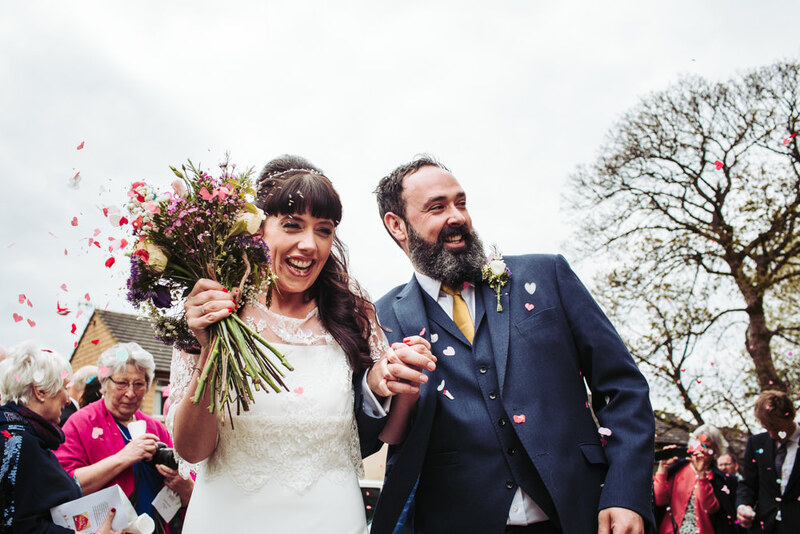 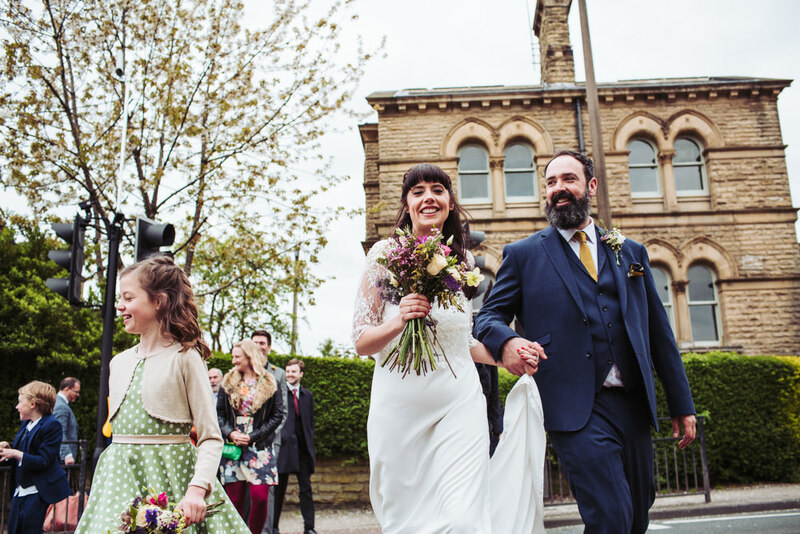 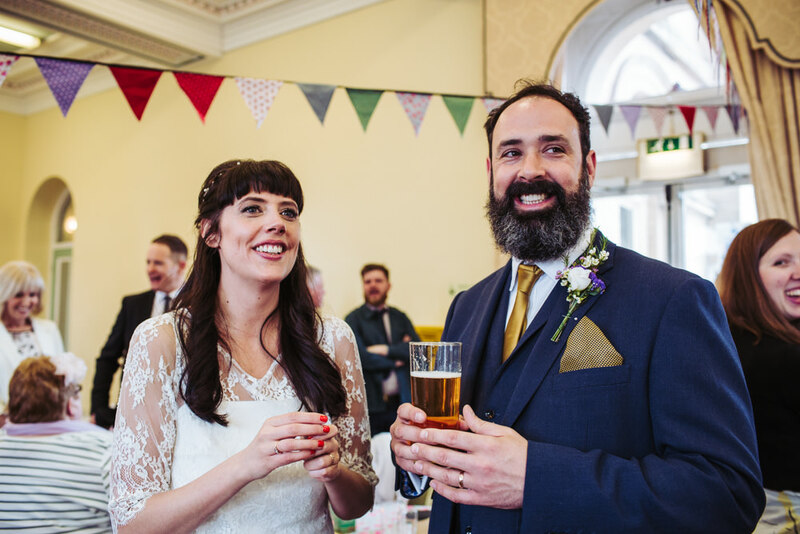 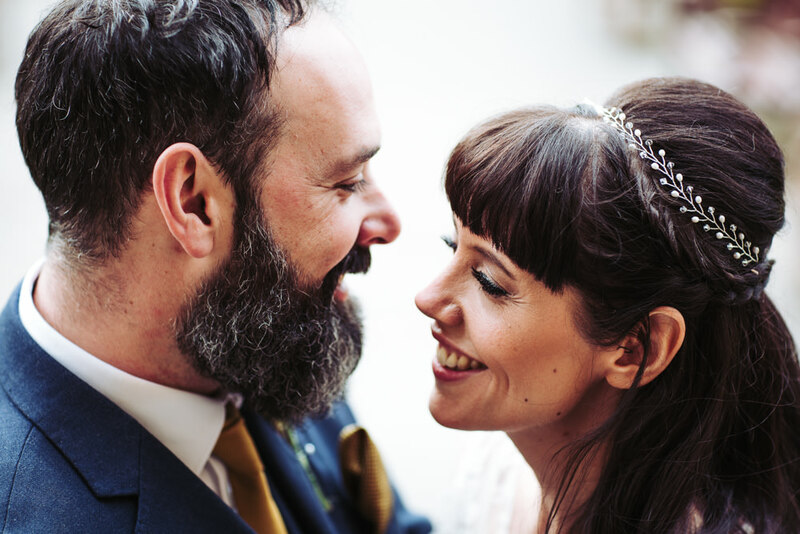 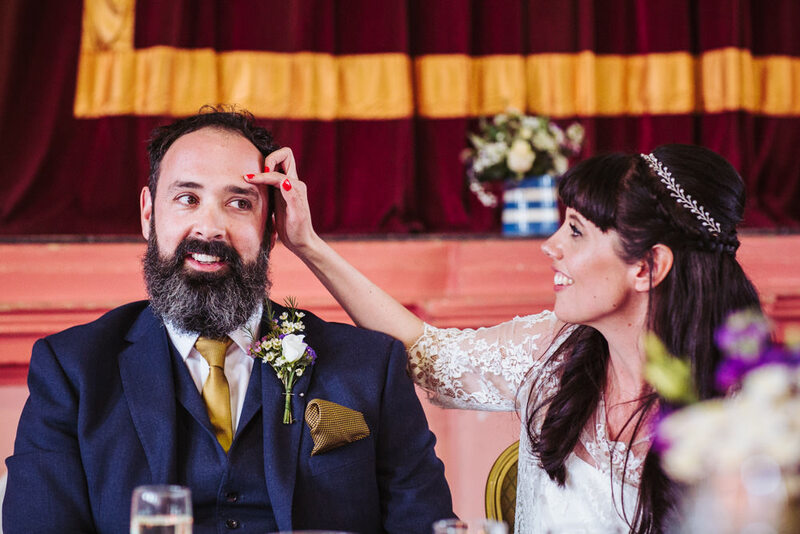 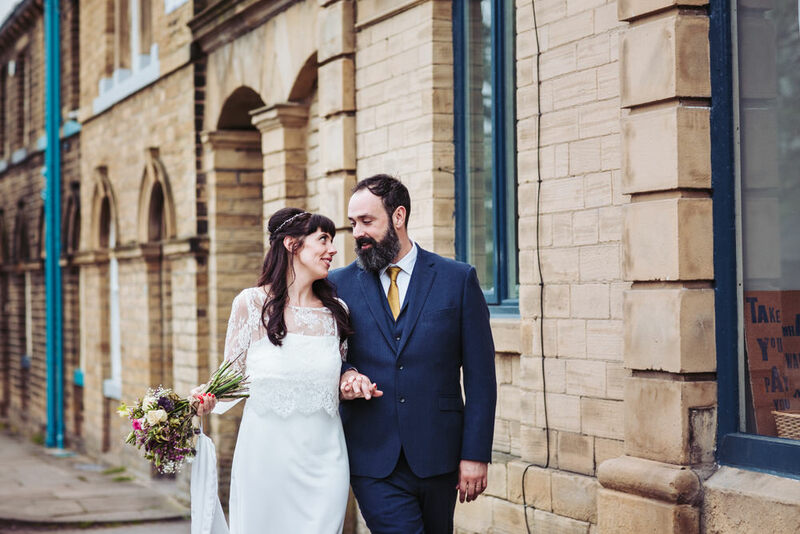 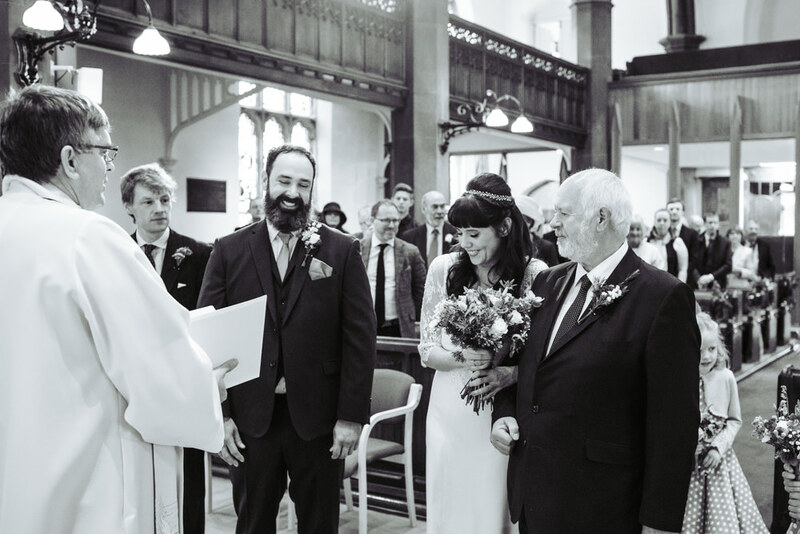 The wedding ceremony took place at St. Paul’s church in Shipley after which Beth and John led a parade of guests on the walk to Victoria Hall, in the beautiful UNESCO world heritage site, the Victorian industrial village of Saltaire, for their reception. 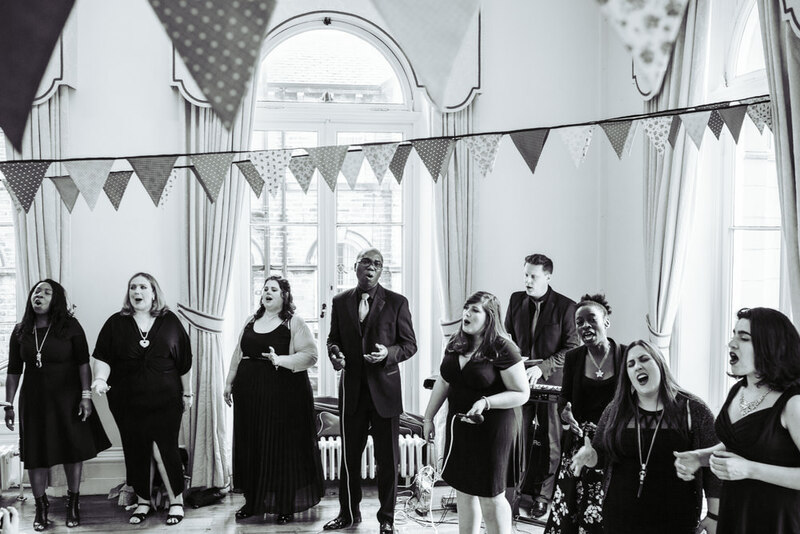 Here Beth’s sister sang as part of her gospel choir group and children played vintage games such as hook a duck and a coconut shy. 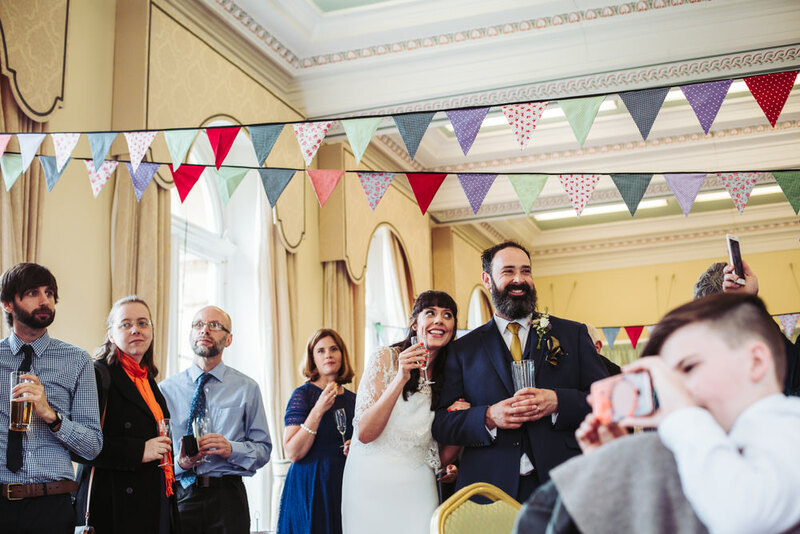 The main hall was decorated with paper ornaments and home made bunting and vintage tins and jugs filled with flowers. 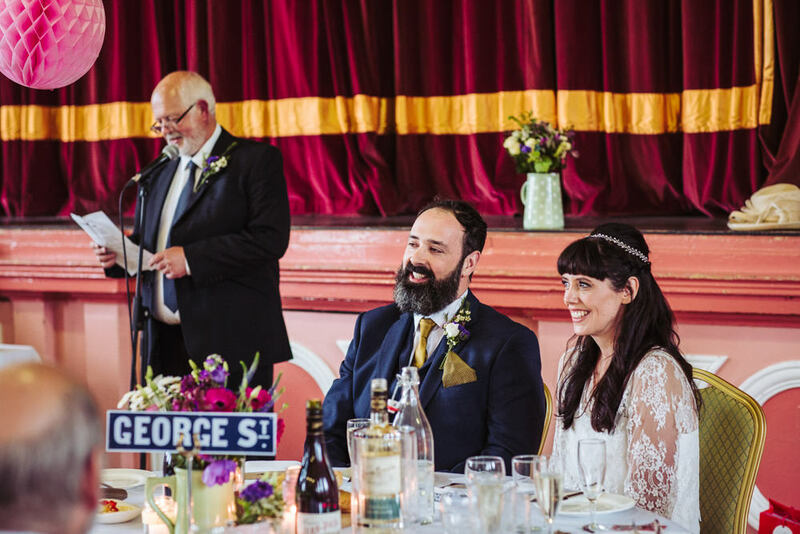 Beth made the table planner herself using Dymo gun text layered over chintzy pattern paper. 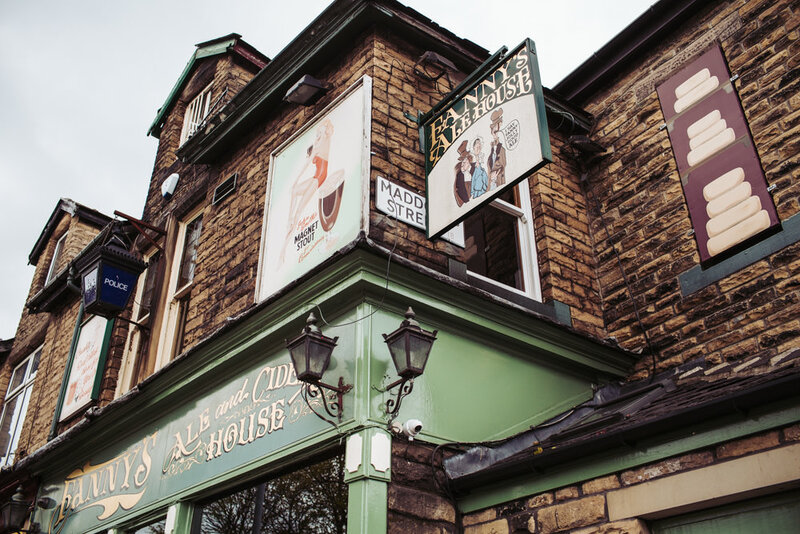 Each table was named after a street in Saltaire village, Jon having made the table signs in the same style of the street signs. 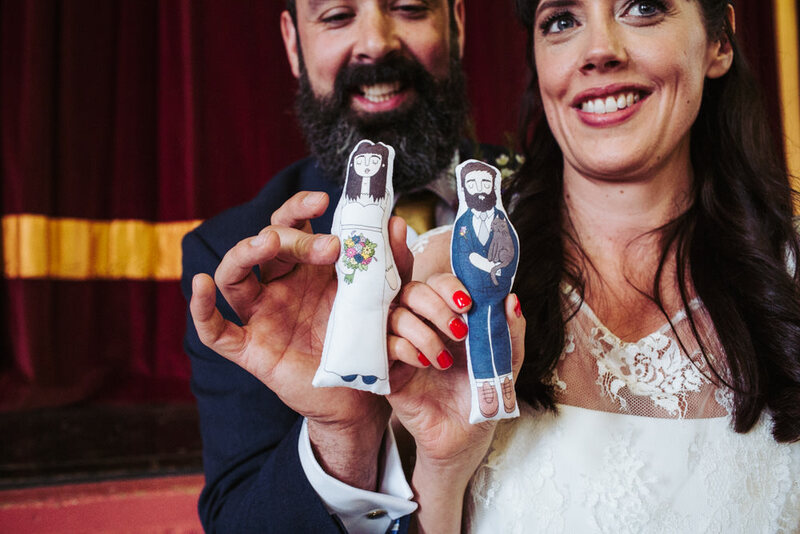 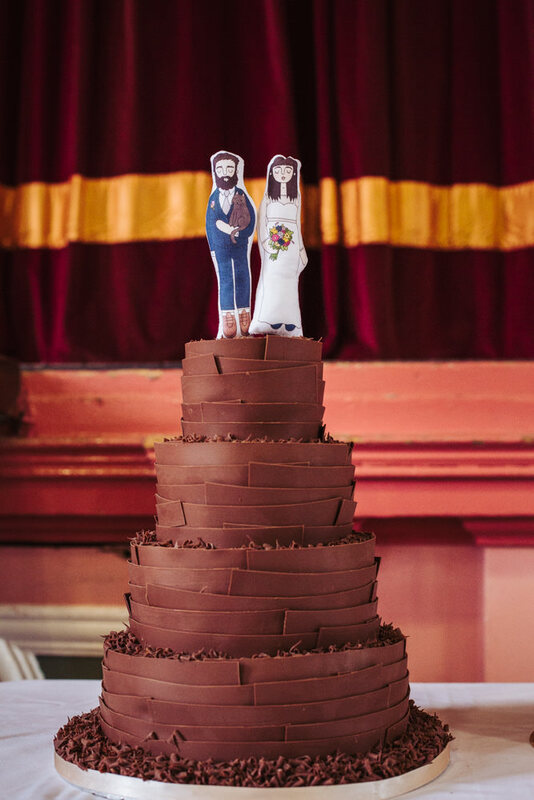 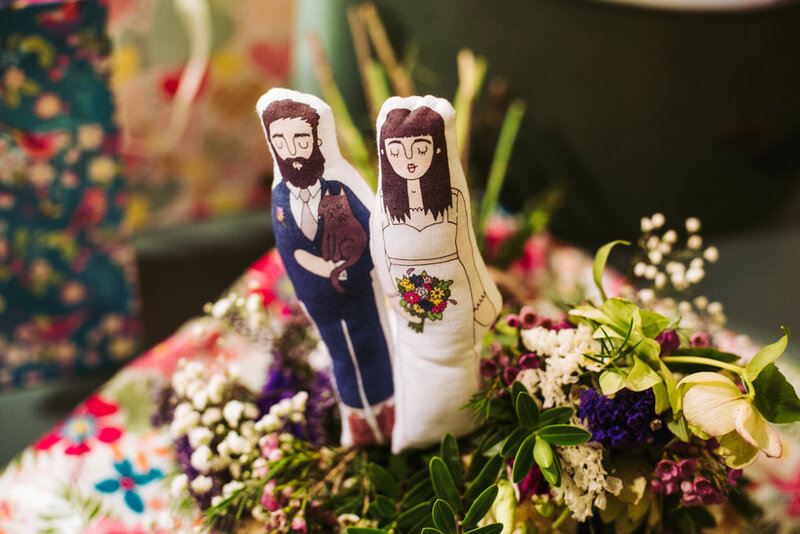 I especially loved the cake toppers, which were bespoke printed illustrations of the bride & groom complete with their cat (who was probably still hiding under the bed at home at this point), printed onto fabric. 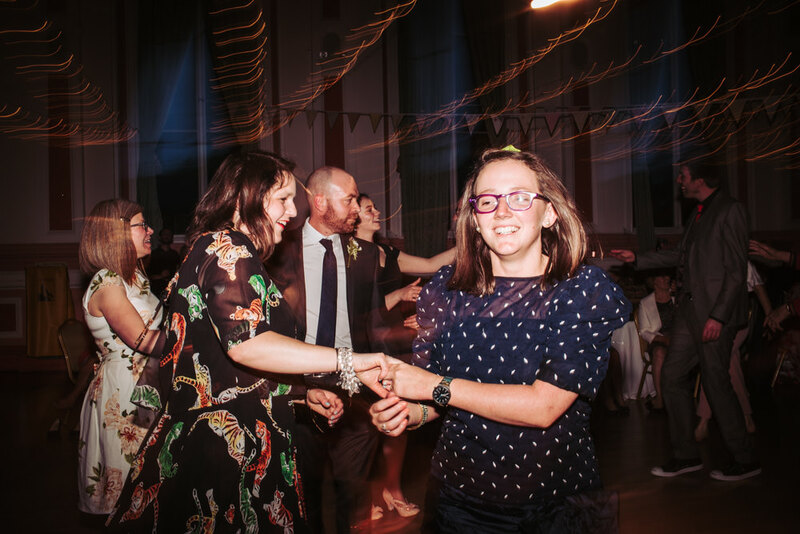 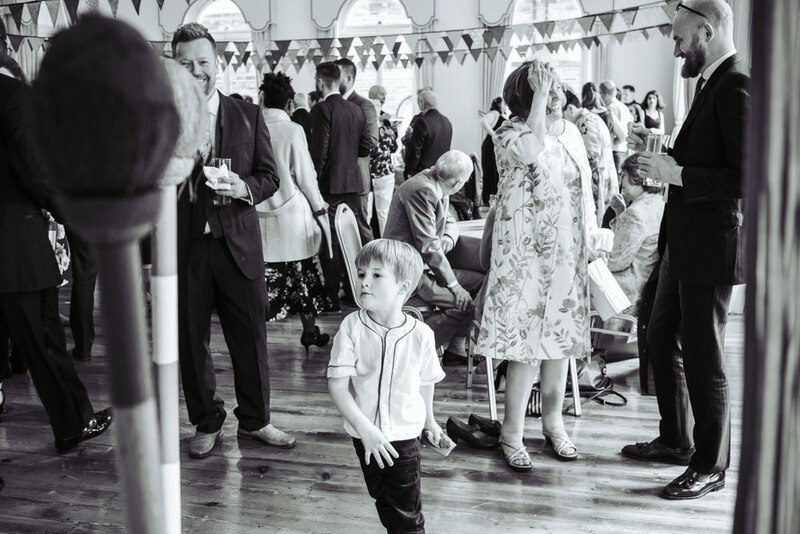 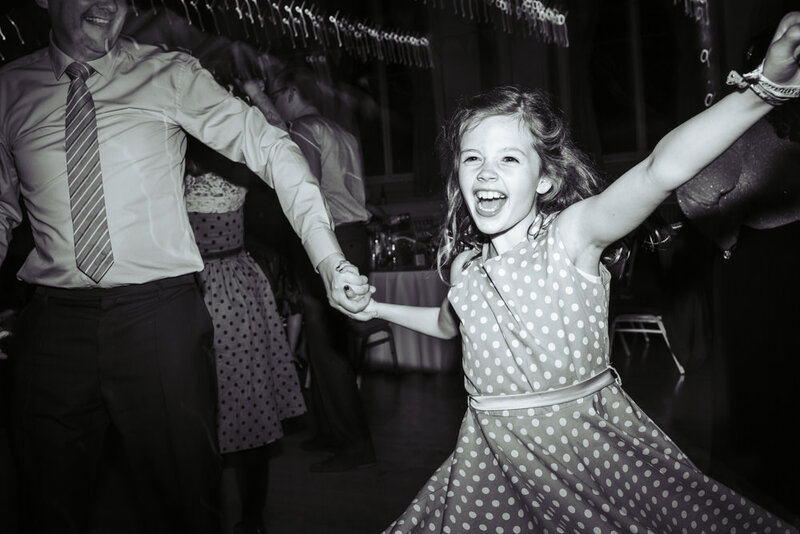 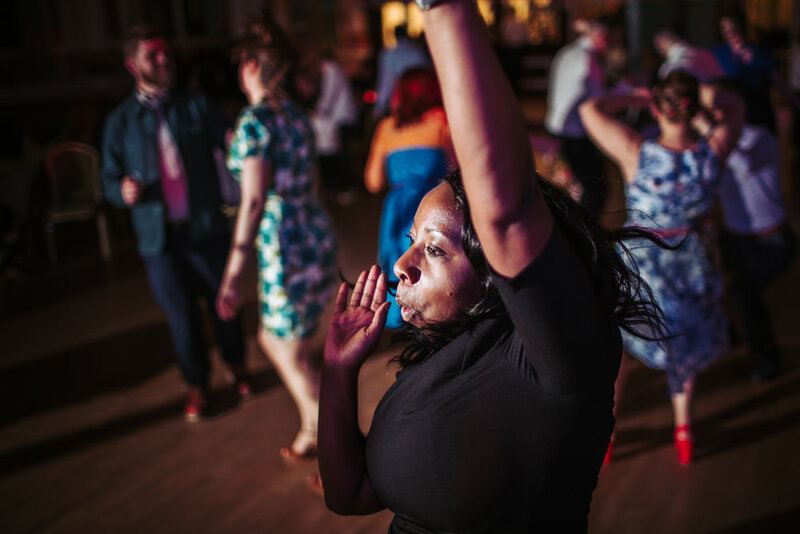 The evenings entertainment began with a family member singing, followed by some epic dancing to a Ceilidh band and for those that still had the energy left, the dance floor grooves continued into the night with a DJ. 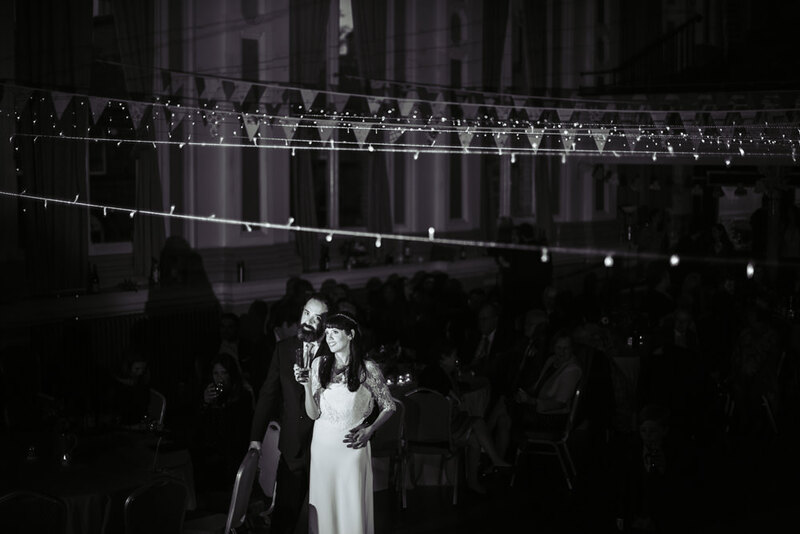 If you’re planning a Victoria Hall wedding, I would love to hear from you! 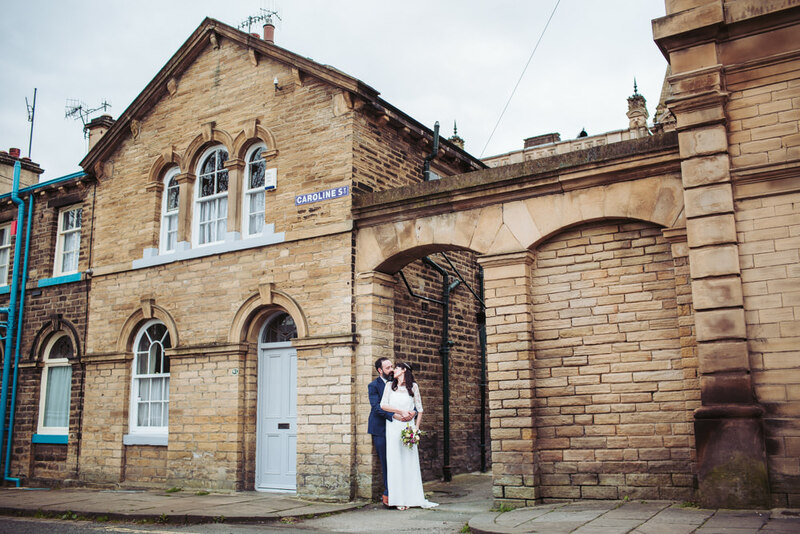 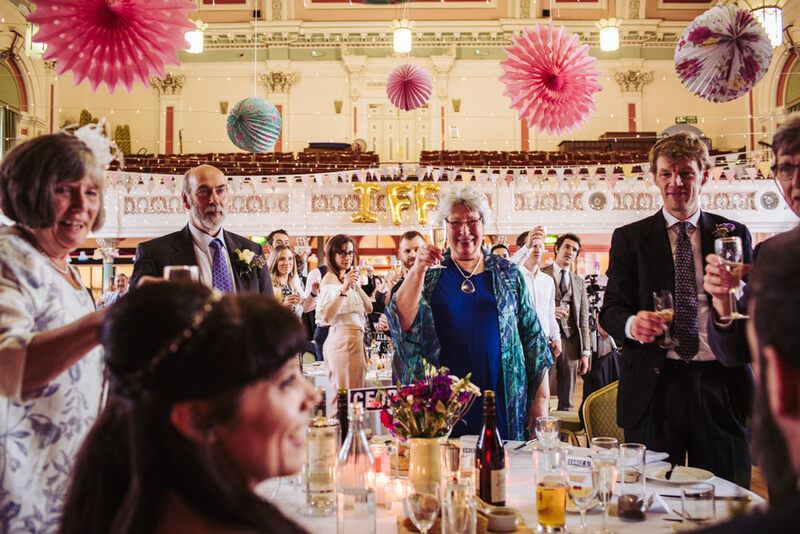 Wedding Venue – Victoria Hall Saltaire, Yorkshire. 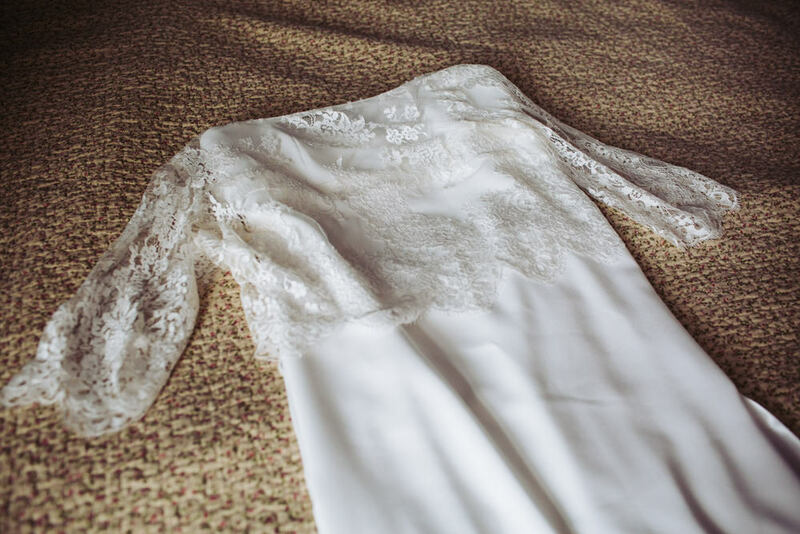 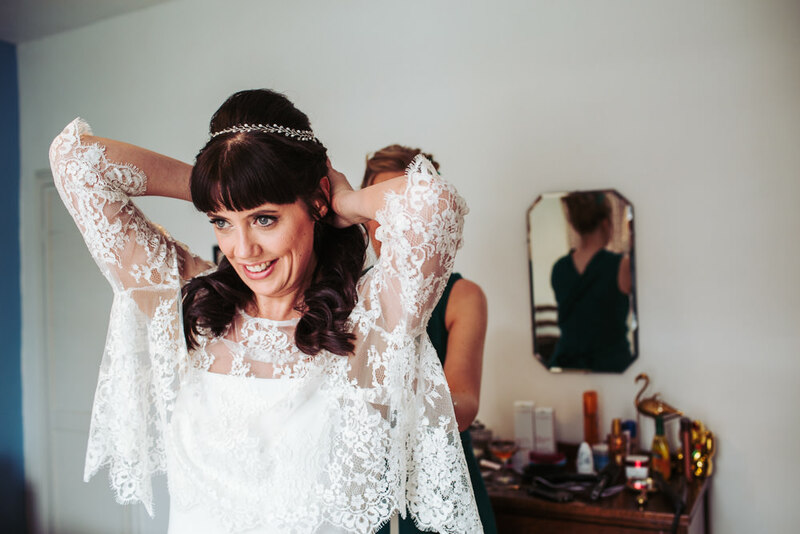 Bride’s dress – came from Flossy and Willow Bridal Studio. 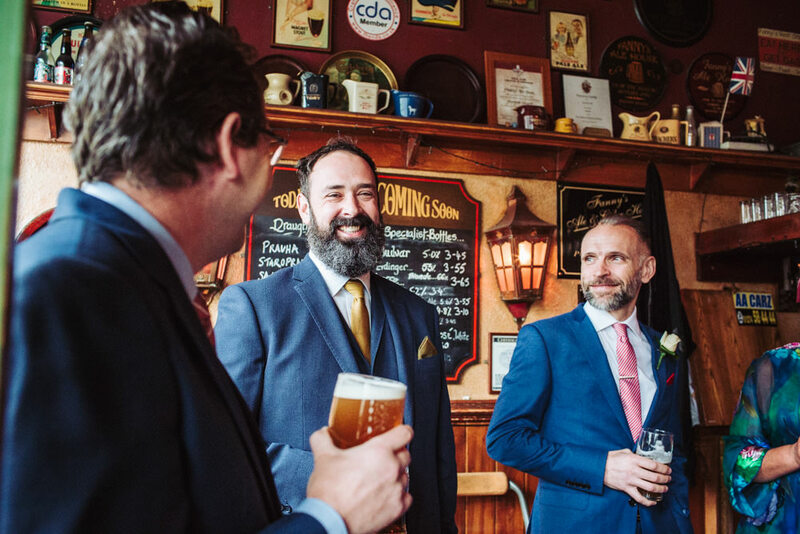 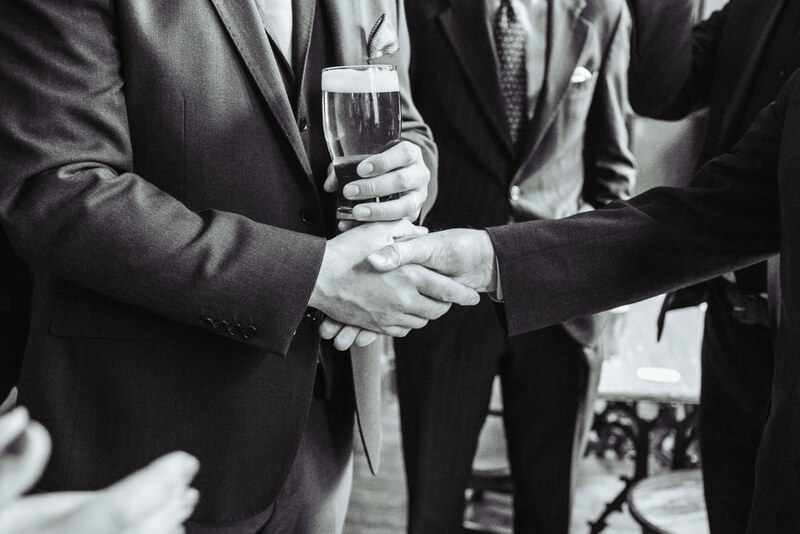 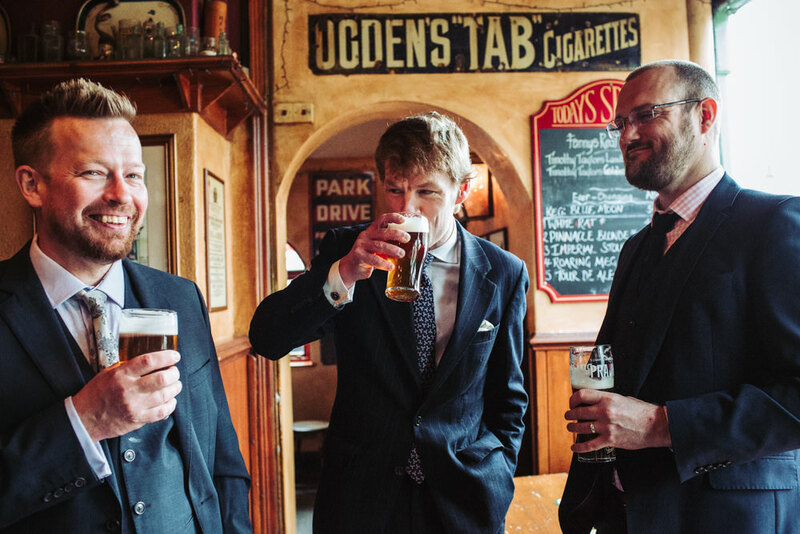 Brand of grooms suit and groomsmen – Skopes. 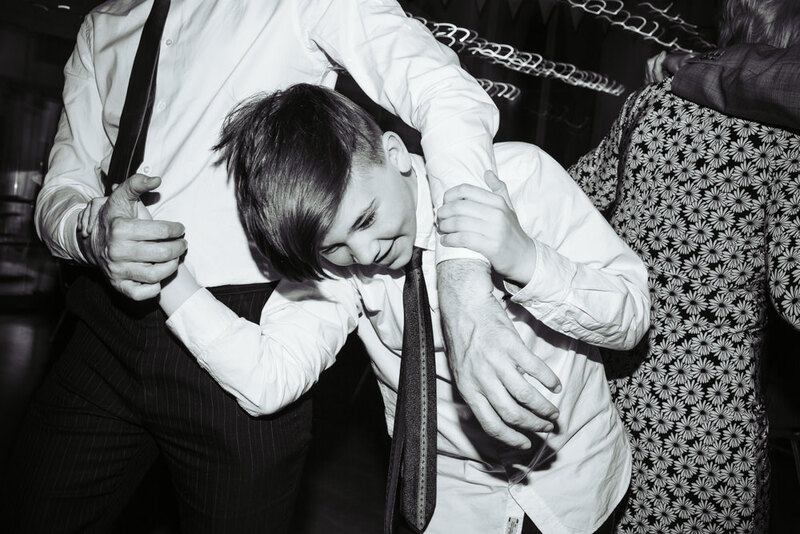 Florist – Katy Trohear-Hands (friend of the bride and groom). 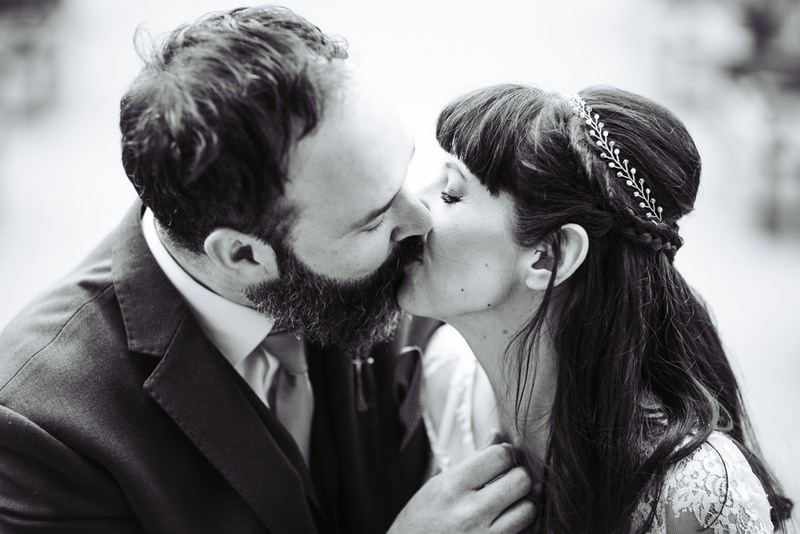 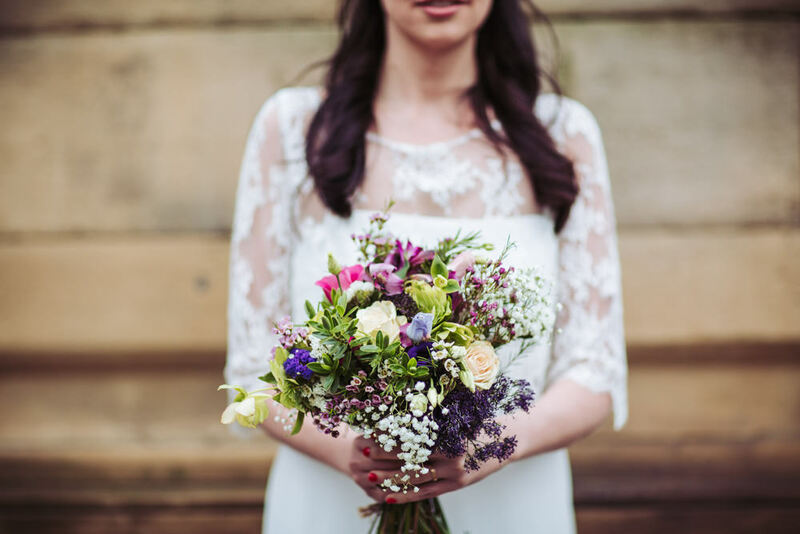 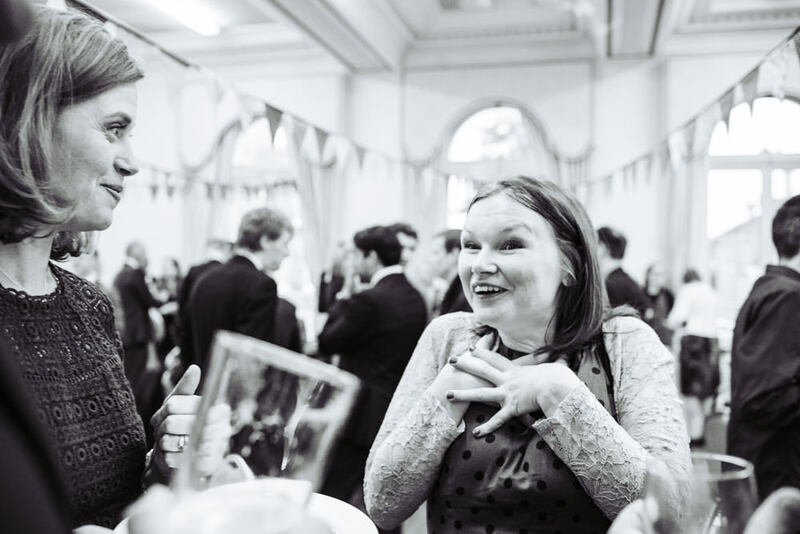 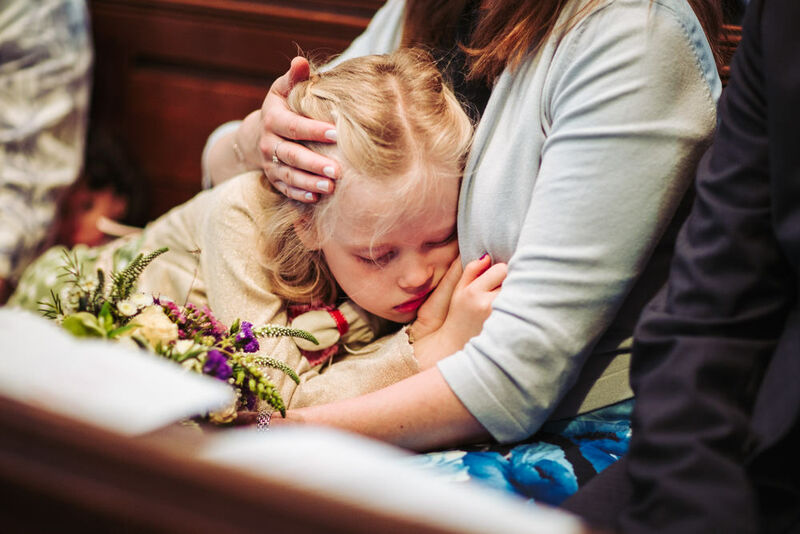 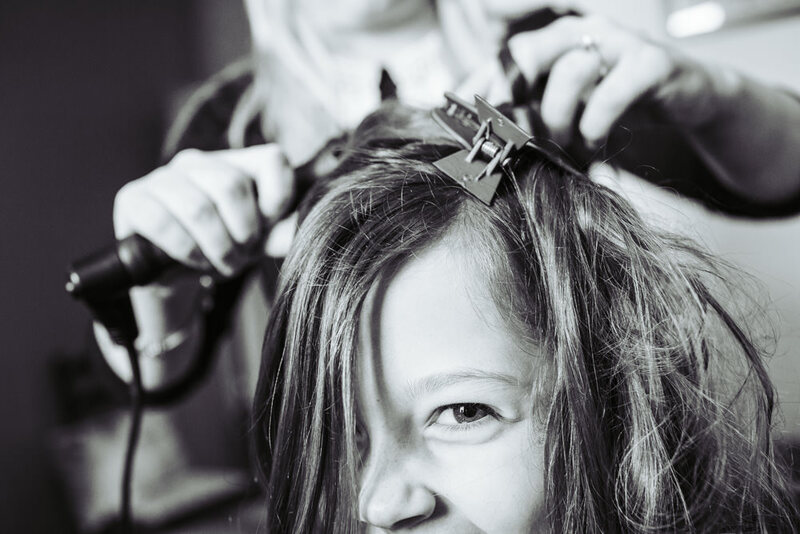 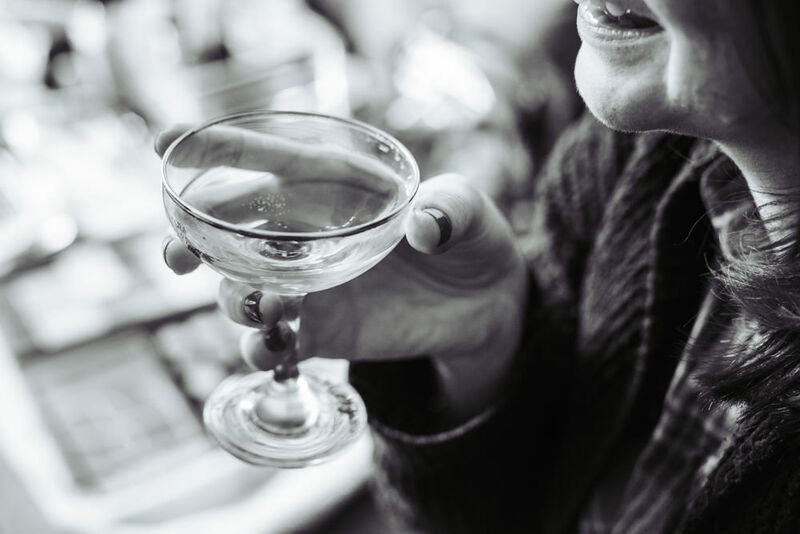 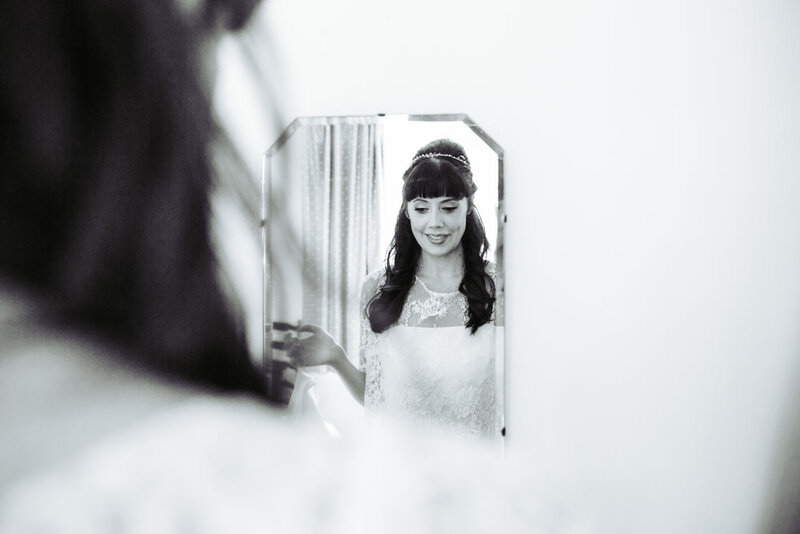 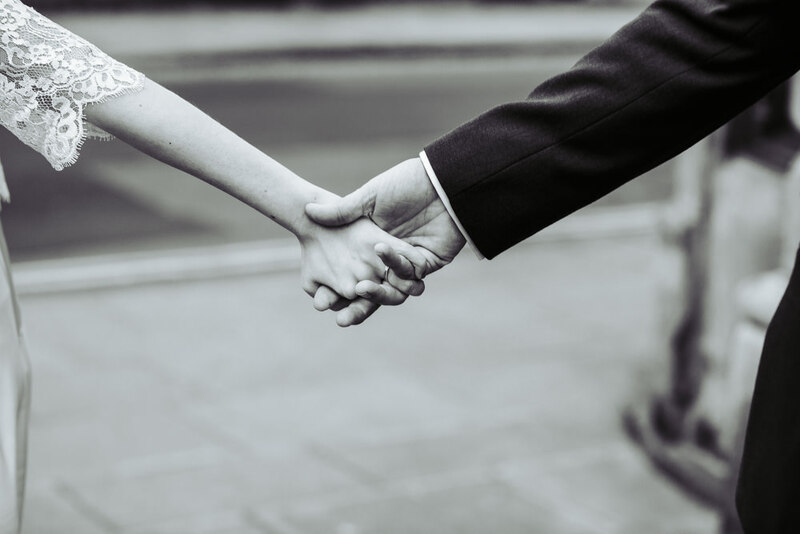 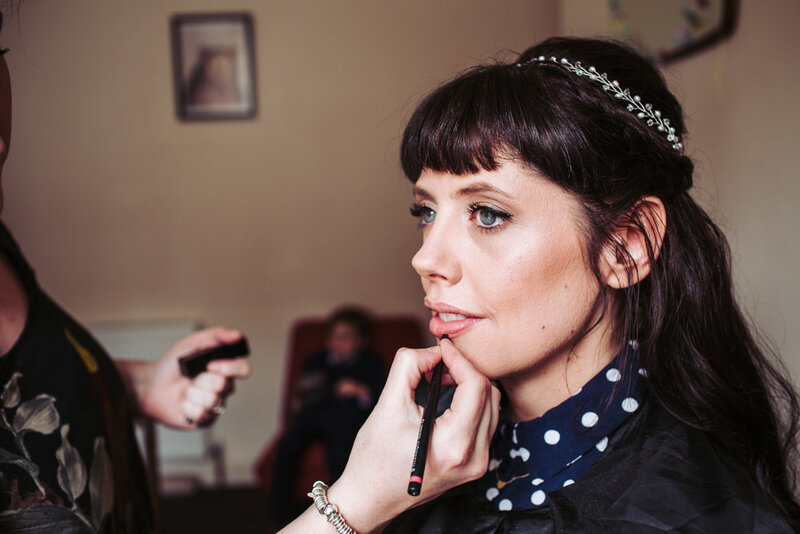 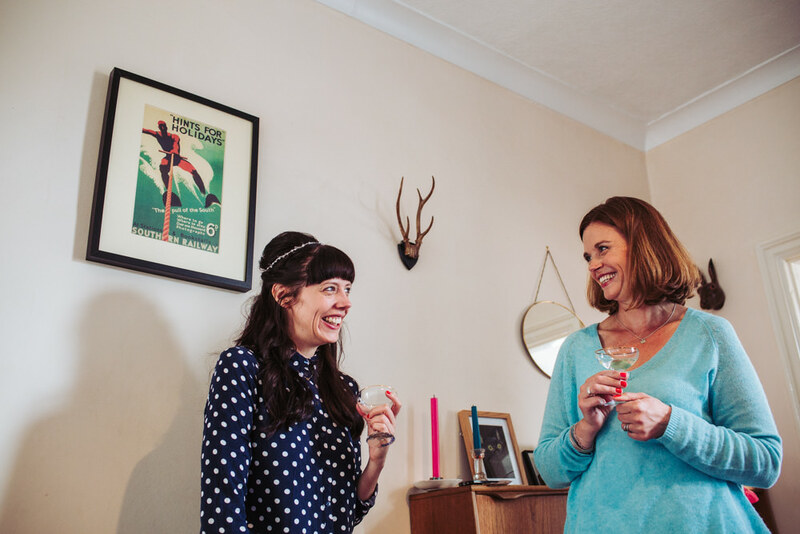 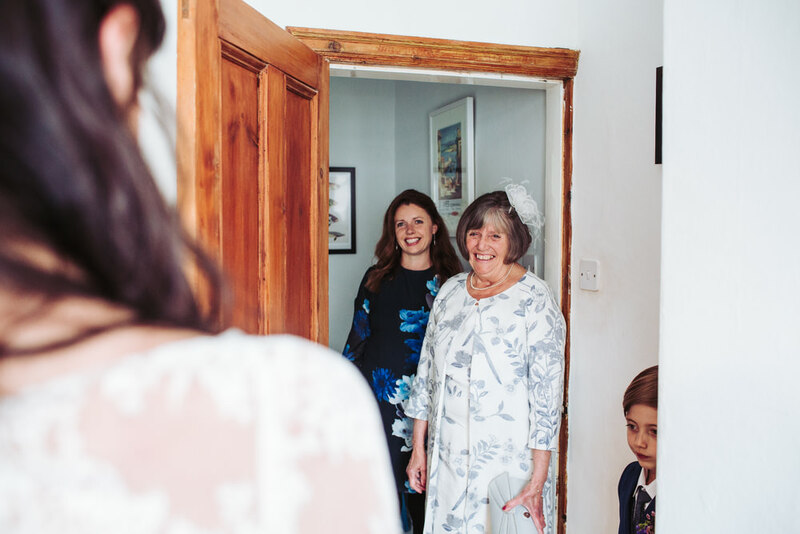 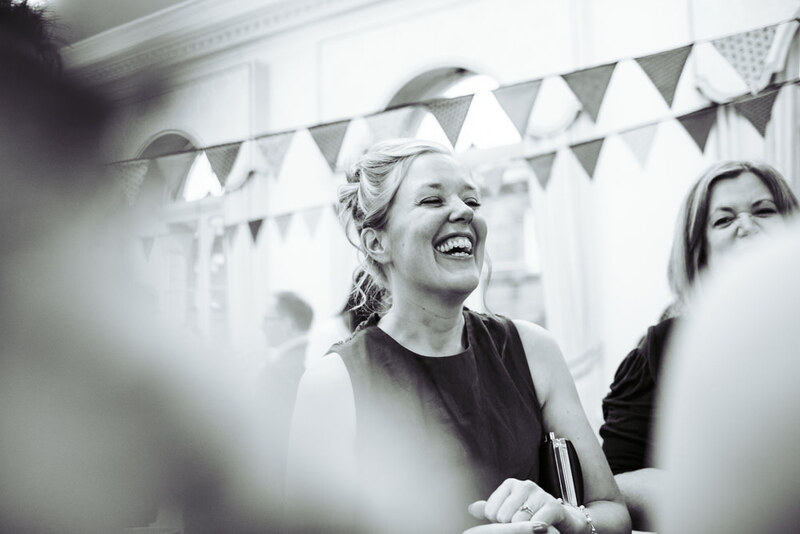 Stylist or wedding coordinator – Charlotte Miller of Eden & Eve. 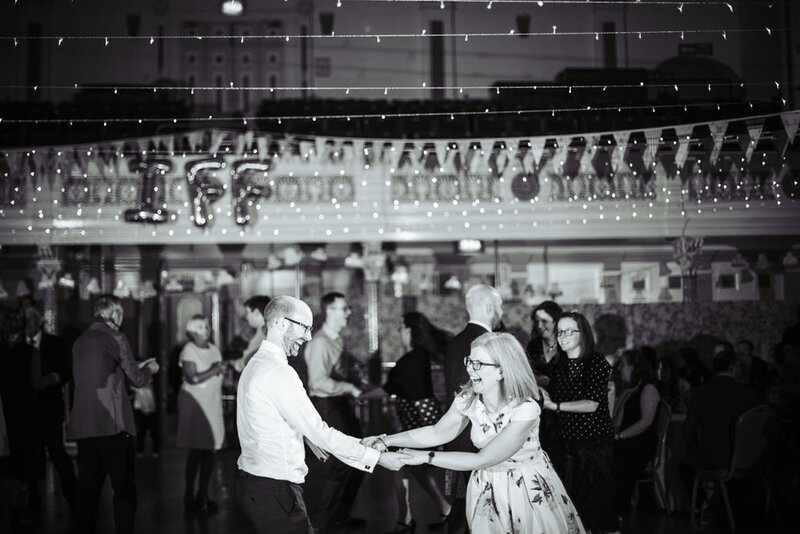 Entertainment – Phoenix Ceilidlh band. 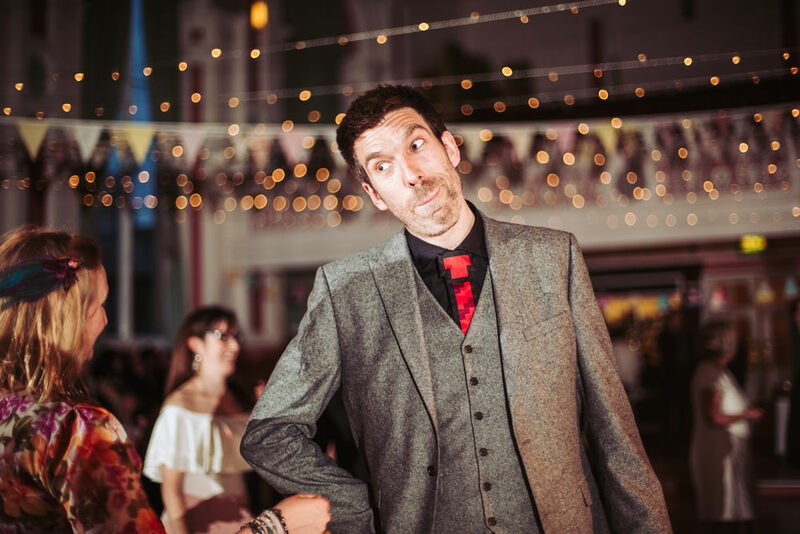 Singer songwriter – Daniel Coughlan (Beth’s family member).